Turkish President Recep Tayyip Erdoğan on Monday said that Turkey was the only country that could lead the Muslim world. “Turkey, with its cultural wealth, accretion of history and geographical location, has hosted diverse faiths in peace for centuries, and is the only country that can lead the Muslim world,” he said in a meeting with religious officials. Touching upon Turkey’s fight against terror, the president said: “We will continue to take every measure needed against terrorist organizations. We have inflicted heavy blows to these organizations during this period. We have neutralized approximately 7,500 Daesh and Kurdistan Workers’ Party (PKK) terrorists. 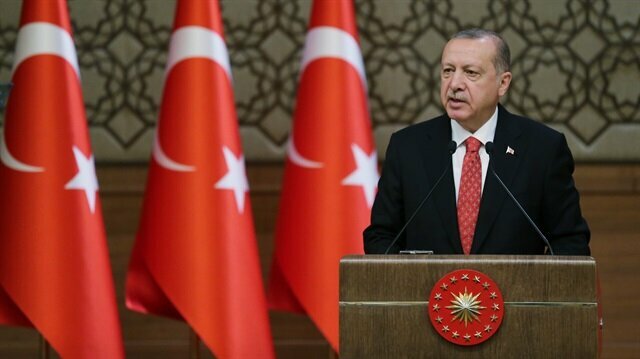 Turkey mounted the greatest struggle against the terror group Fetullah Terrorist Organization (FETÖ) under its current leadership, Erdoğan said. “The real struggle against FETÖ was waged only in our term,” Erdoğan said, referring to the , the group behind a defeated coup in 2016. “But let me tell you, we were late too. Unfortunately, we paid the price for being late,” Erdogan added, speaking to a group of muftis at the Presidential Complex in the capital Ankara. A Turkish teacher who worked in FETÖ-linked schools in the United States from 2008 to 2015 gave a first-hand account of his time with the terror group.Ersin Konkur, who is living in the U.S. for the past 10 years, has witnessed many unlawful incidents in charter schools of the terror group. Konkur said because of the wrongdoings, he felt alienated and eventually left and filed a lawsuit against FETÖ.Konkur said FETÖ is listed as a terrorist group in Turkey, but not in the U.S."They need to be listed as a mafia in the U.S.," Konkur said. "They are indeed a mafia. They con the state and steal from it. There are people in the U.S. government, in the FBI, that scour the bank accounts of the group members. These things will eventually come into light. "FETÖ and its U.S.-based leader Fetullah Gulen orchestrated the defeat coup on July 15, 2016 in Turkey, which left 251 people martyred and nearly 2,200 injured.Ankara also accuses FETÖ of being behind a long-running campaign to overthrow the state through the infiltration of Turkish institutions, including the military, police, and education.FETÖ also has a considerable presence outside Turkey, including private educational institutions that serve as a revenue stream for the terrorist group.Konkur said that Western countries who support this group know that it is "full of liars".FETÖ terror group afloat in Ethiopia with German supportPaying backHe said that the FETÖ structure around the world, including its schools, requires employees to pay back to the group. "Whether they are school principals or teachers, they must pay from their salaries to the group," he said.Sharing his experience about a FETÖ charter school in the state of Texas, Konkur said the system works "when you always give something from your salary". "A school principal told me that he would sign me to a salary, for example, $3000," Konkur said. "When I see $3500 credited in my bank account that means I have to give back the $500. ""It does not end with that," Konkur said. "You have to pay tax returns, alms (zakat) and money for sacrificial animal. You constantly give them back what you earned. "He added that employees did not get paid for the extra hours they put in. "The school principal told me to work extra on Saturdays, but to give the money to him," he said. "It does not matter if you work hard or not. You are getting paid according to your social status in the group. It is like a communist system. "Misusing staffKonkur said administrator-level employees carried out the unlawful tasks. "I have never been a manager in those schools. One time, I was offered a principal duty in a school in Syracuse. I told them I would not do their illegal business. They withdrew their offer when I said so. "The terror group also does illegal paper work to overpay their members, so that the extra money goes in their accounts. "There was a teacher in Dallas in the year 2012-13. That person was teaching Turkish. Because the group applied to the work visa of this individual as a deputy school principal, he was getting paid $60,000 annually. But in fact, his earnings should have been around $48,000 if he was registered as a teacher. I complained to the Texas Education Agency. They understood I filed the issue, so eventually I left Texas," Konkur said.FETÖ gives all tender bids related to its charter schools to its own affiliated organizations, he said.“When any kind of services or items are needed to be purchased for the schools, the group finds a way to create business with its members and everything is done through that firm.“These charter schools are so-called non-profit schools. The mentioned foundations are also non-profit foundations on paper. However, the money we are talking about is huge. We are talking about $10,000 per student right now. The money is under their control and in a way, it is being transferred to Gulen’s companies. "FBI investigationHe said the FBI and other concerned state authorities are investigating fraud in the schools.“I do not know the FBI’s approach on this, however, I do know that there are people who are closely following the matter.”He said there is no freedom in the FETÖ structure and a person needs permission even to get married.Konkur said he has filed six claims against FETÖ-affilated institutions and the judge has accepted three, related to money taken from him through threats.Describing the FETÖ's journey to terrorism, he said: “From my understanding, they channeled the government’s resources into the organization at more serious levels in Turkey than it was done in the U.S. You are feeding your organization through government resources. When the tap shuts, then there is crisis within the organization.”He finally called on those affiliated to FETÖ and urged them to "open up their eyes. "“My advice to them is to open up their eyes and think; they must comprehend the matters by looking at them from outside," he added. Citing the December 2013 plot against government ministers and leading businesspeople, Erdogan said that if Turkey hadn't fought FETÖ since that plot, despite obstruction by the main opposition, the 2016 coup attempt would have turned out differently. FETÖ and its U.S.-based leader Fetullah Gülen orchestrated the defeated coup of July 15, 2016, which left 251 people martyred and nearly 2,200 injured. Dec. 17-25, 2013 saw a graft probe and the detention of prominent figures in a FETÖ plot to overthrow Turkey’s elected government.